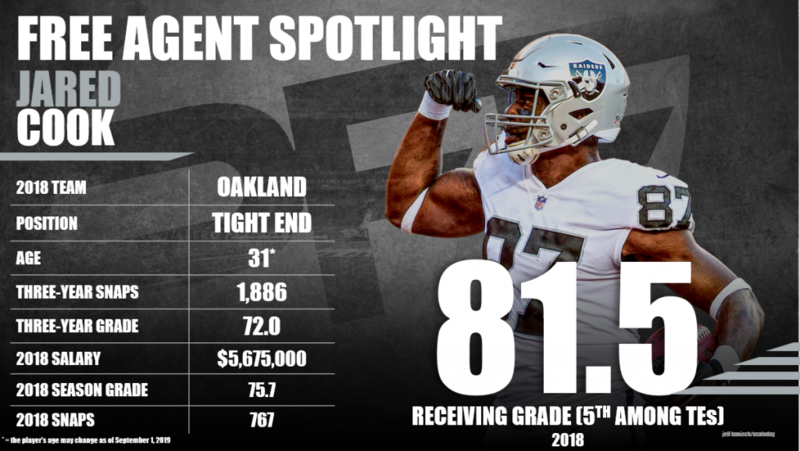 Jared Cook had one of the best years of his career with the Oakland Raiders in 2018, earning an impressive 75.7 overall grade in the process. He was a safety blanket for Derek Carr all year and thrived in that role, making it that much harder to believe Oakland lets him go this offseason. Cook hasn’t been too consistent throughout his career, which warrants concern given that he’s had just two years 75.0-plus overall grades. However, he still proved well worth another short-term deal with his production in 2018. Subscribe to Pro Football Focus’ ELITE subscription to research Jared Cook’s grades, advanced stats, snaps and more in Premium Stats 2.0.